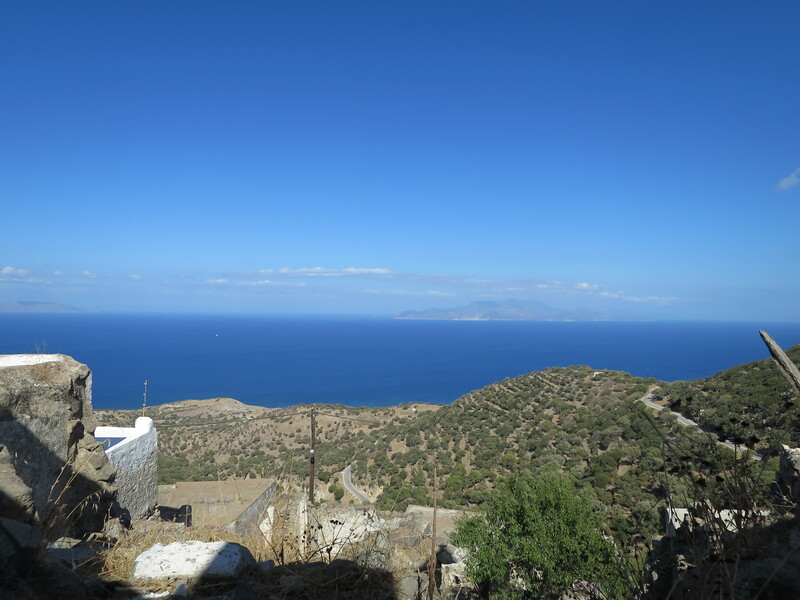 Little Odysses and ‘Business’ Lunches – Nisyros and Kalymnos. What is it about glimpsing an island on the horizon that immediately fills you with the need to go there and get a closer look. The compulsion to travel to lands that we can merely glimpse from afar must be one of the oldest desires of mankind. I defy anyone to resist that simple urge to go to that hazy bank on the other side of a river, or to some barely visible shore across the sea. Our natural human curiosity cannot, it seems, be suppressed and it always drives us across any stretch of water to explore that place ‘over there’. Stand on any Greek harbour and, more likely than not, there will be a boat to take you on to the next port in the seemingly endless chain of islands. On Kos where so many other islands and, arguably, even another continent, seem just an arm’s length away the temptation to travel is irresistible. We succumb and board a boat to Nisyros. 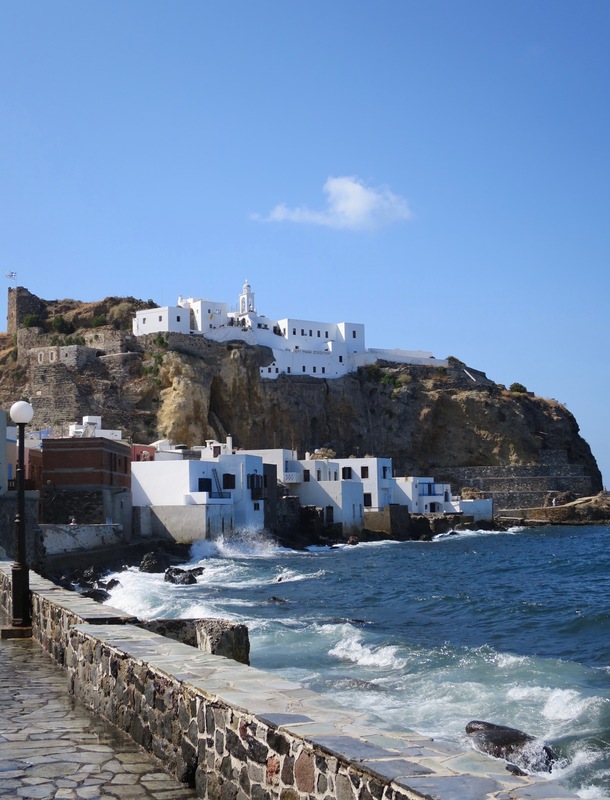 Nisyros lies just off the southern coast of Kos and after an hour’s boat trip, the traveller finds herself at the island’s port, Mandraki. It is a delightful town, with winding streets and a hilltop castle and the chapel of The Madonna of the Cave set deep within. With waves breaking on the rocks close by, we find a baker with freshly baked pies and kouloúria – a quick bite and a coffee set us up for further exploration. 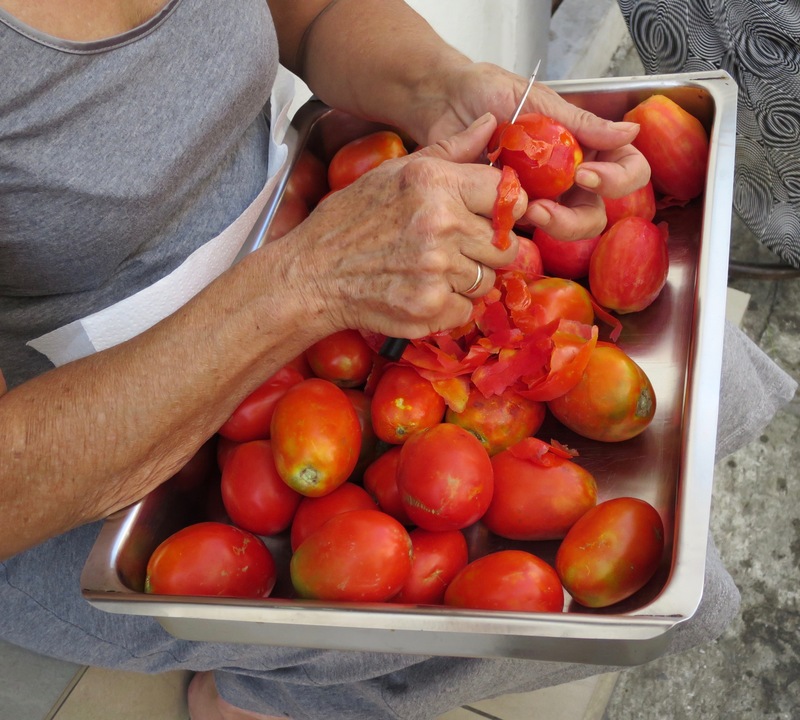 Sat on a doorstep a lady is peeling plum tomatoes. ’For sauce?’ Is the question. ‘No, for a spoon sweet.’ She replies. Domatáki Glykó is a delicacy of these islands; syrup-preserved and almost caramelised, the plum tomatoes take on the texture of candied fruit. This is an island forged from stone and magma, in fact the centre of the island is a vast, volcanic caldera which is still seething and active. 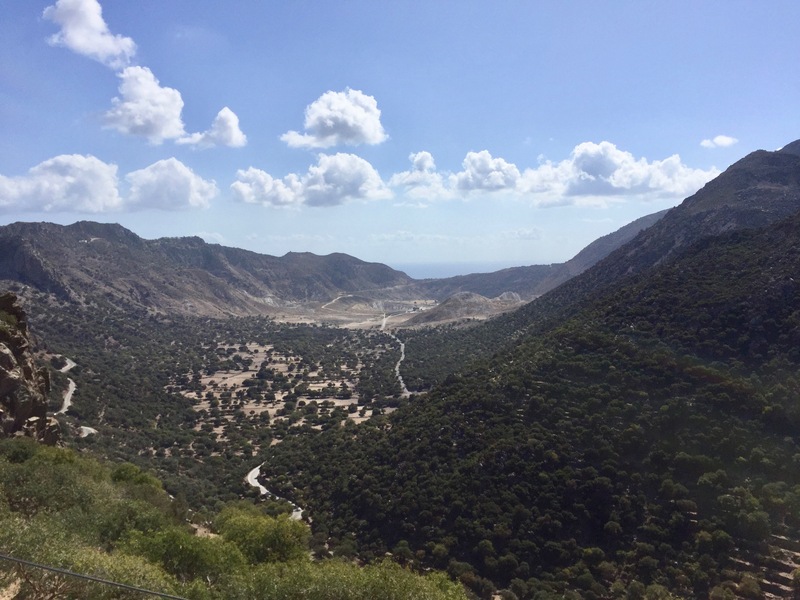 No visit to Nisyros is complete without a trip to the volcano’s biggest explosion sink, ‘Stefanos’. It is an almost lunar landscape, with fumaroles venting boiling steam and a sulphurous atmosphere. In the crater it is hot and in the midday sun the utter whiteness is blinding. In search of respite we make our way up the mountain to the village of Emborió. Emborió teeters on the edge of the caldera, clinging to the rocks with true hellenic tenacity. The word Emborió has the same roots as the word ‘emporium’, and tells us that this was once a vibrant place of trade and business . Now though there are too many abandoned houses; we pick our way through shells of family homes which, in a curious way, have become as picturesque as the well-maintained ones. Personally, I would prefer to see them all lived in and that Emborió was as busy as its name implies. 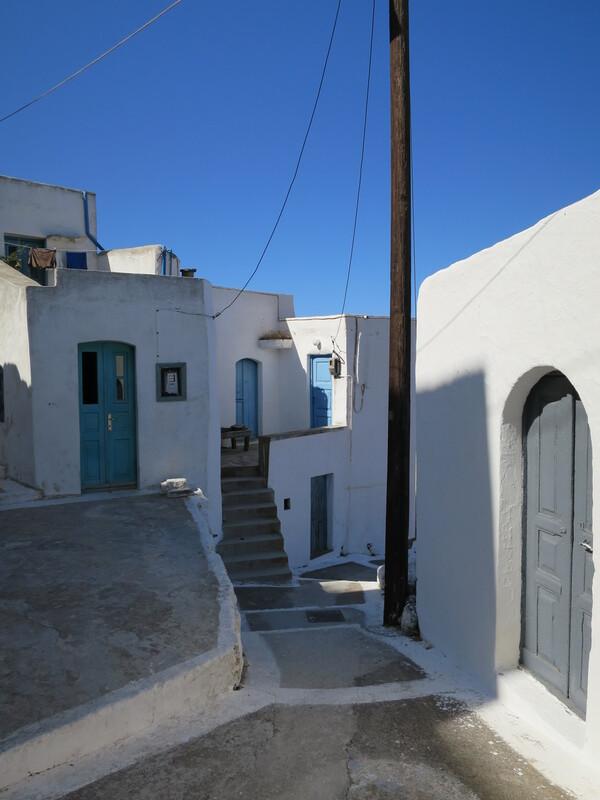 Walking through its narrow streets you are certain that you could be nowhere else in the world; it is a quintessential Greek village, with whitewashed walls set against a cloudless, azure sky. Lunch is at the village’s only taverna, a rare place of business these days, ’Tó Balkoni tou Emborioú’, with its tables set on the balcony and an unsurpassable backdrop. 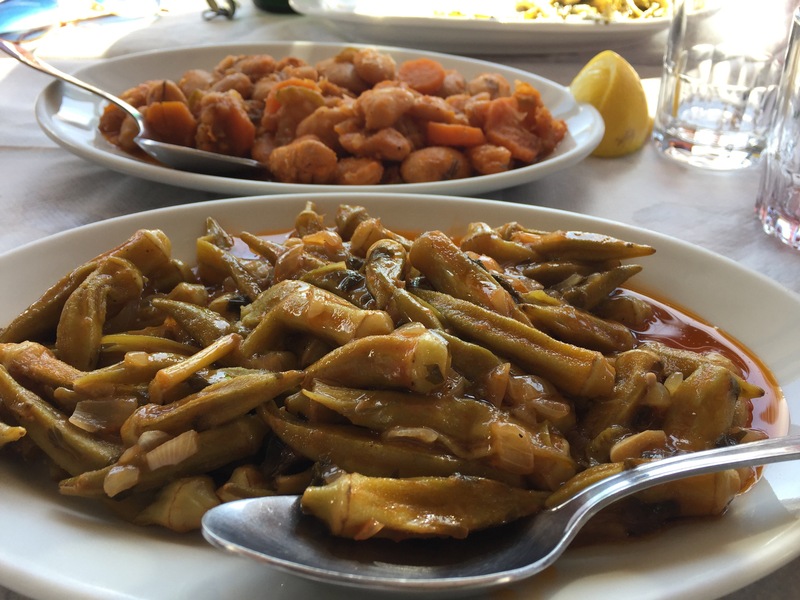 Overlooking the caldera, we dine on tiny stewed okra; the skill of the cook meaning that they are still intact and none of their gluiness has seeped into the sauce. There are ambelofásoula, fresh black eye beans complete with pods, but these aren’t just boiled – here they are braised with oil and spring onions and delicately flavoured with dill. 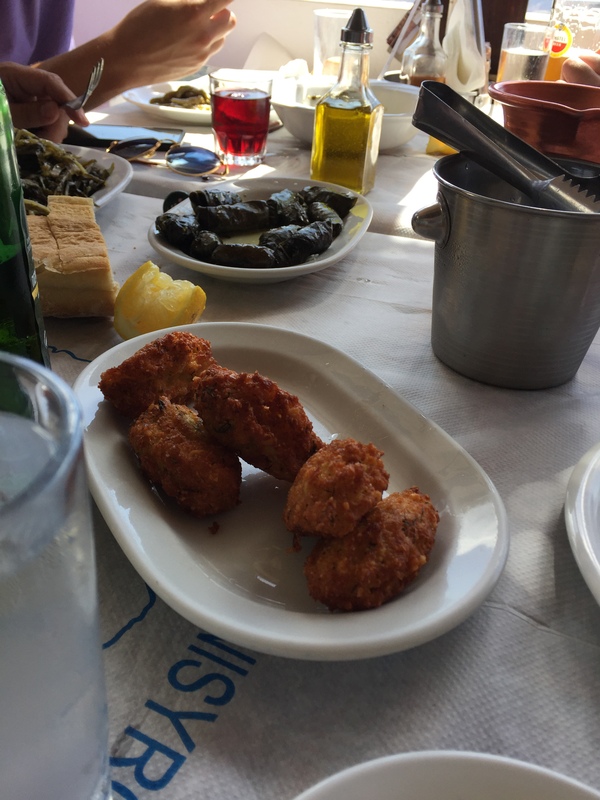 The stuffed courgette flowers and vine leaves are culinary masterpieces and the signature dish of crisp, light, chickpea fritters, revithokeftédes are absolutely faultless. This is the most perfect of lunches; talk and laughter and food and wine, all framed by the most incredible of views. We meander and marvel at this most beautiful of islands until our time is up. Our boat is in the harbour and the journey back to Kos is accompanied by the setting sun. ‘Come with us to Kalymnos!’ Our friends propose a few days later and, of course, we offer no resistance. From the beach where we swim most days we can see Kalymnos, fawn-coloured and dry, emerging from the sea like some vast basking creature; obviously we need to visit it. Again the journey is only an hour but this time we go north. Kalymnos is an island of sheer rock faces, of bays and fjord-like inlets, rock-climbers and sponges. We drive along the coastal road until we come to a seaside village and it’s name is Emborió. Like its namesake on Nisyros, this Emborió would too once have been a place of business and commerce, with the wealth of Kalymnos coming from sponges and the fearlessness of her skilled sponge divers. Now Emborió is a charming little harbour for sailboats and yachts to drop anchor for a while and the business comes from the fish restaurants on the beach. 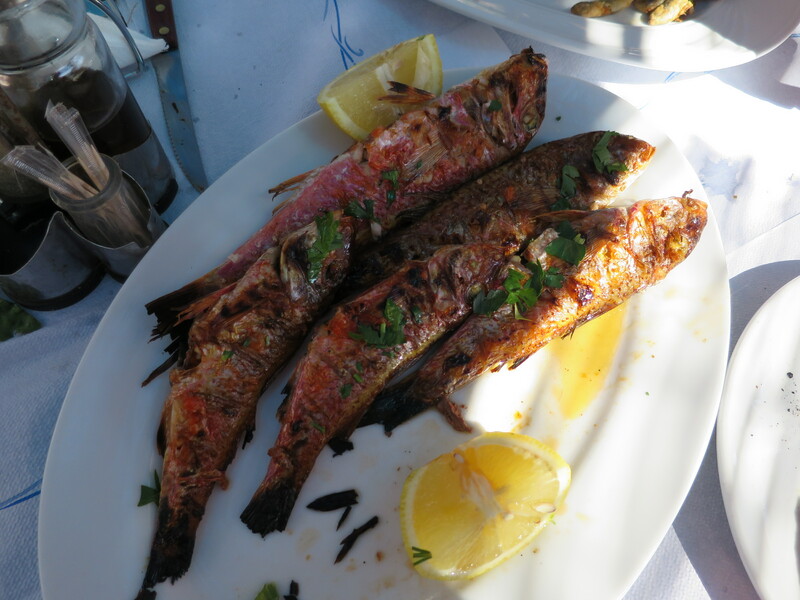 At the taverna ‘Captain Costas’, we chat with the eponymous captain for a bit and he tells of his years at sea, first as a sponge diver and then as a fisherman. We get a lesson in choosing a good sponge – not the lacy ‘kapádiko’ type, the unbleached ‘fíno’ variety, with tight pores, he says, are the best. 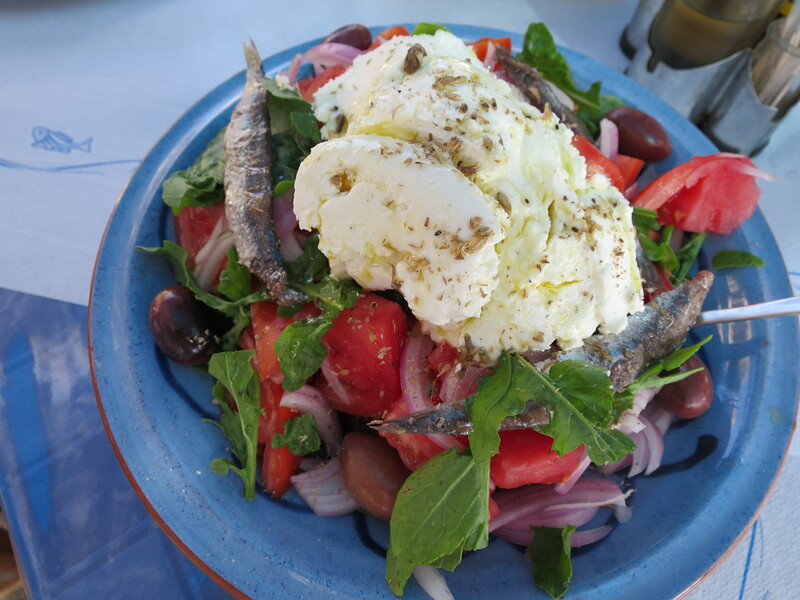 Lunch is eaten on the beach and starts with the house ‘Kalymnian Salad’ – ripe tomatoes, pungent olives and crisp cucumber, on a base of crunchy, ‘kouloura’ and topped off with a mountain of creamy, fresh, home-made cheese. In such a place as this our main dishes obviously come from the sea; grilled octopus, the season’s tiny fried whitebait and fragrant, red mullet, all just caught and all cooked to perfection. 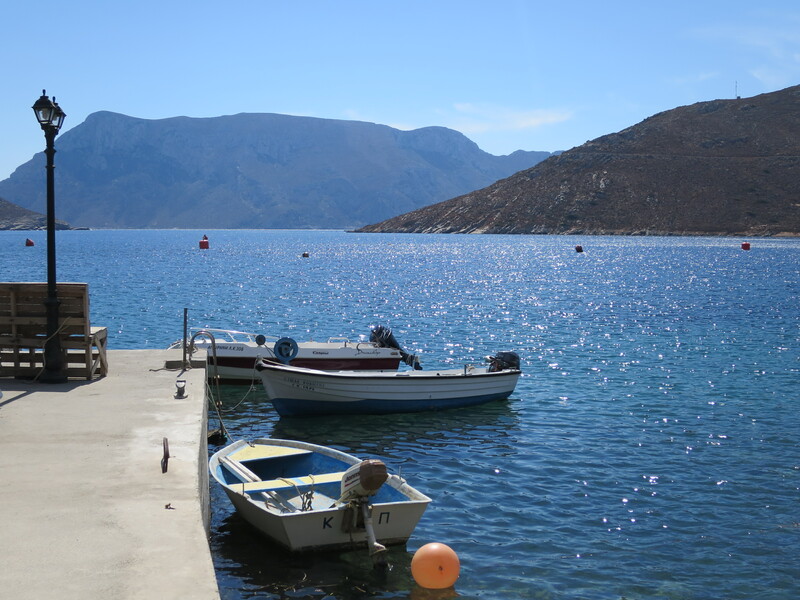 Our time on Kalymnos comes to and end too soon and the ferry awaits. Watching the harbour, with its houses stacked up on the hillside recede, it strikes me yet again that no two Greek islands are ever the same – each has its own individual style, its own features, its own culture, cuisine and traditions. These three island that are so very close together could not be more different. You could not mistake Kos for Kalymnos, or Kalymnos for Nisyros. There is no ‘best’ island and there is no definitive Greek island because they are all so different and idiosyncratic. And there it is, the reason for that compulsion to get to the next one and the need to discover more. For this stay, we’ve probably run out of time for anymore little odysseys, but then who knows where temptation leads ? My parents lived in Bournemouth for years and we could see the Isle of Wight from the living room – was very enticing ! What a wonderful description. I can smell the sea and taste the food: I’m with you as I read. Increasingly I am aware that it is the delight in the ‘ordinary’ (but yet it is extraordinary), in the simplest but tastiest food, of what is around us …seeing the beauty in this is one of the ways to be truly happy. Your writing has helped me with that, Jane.